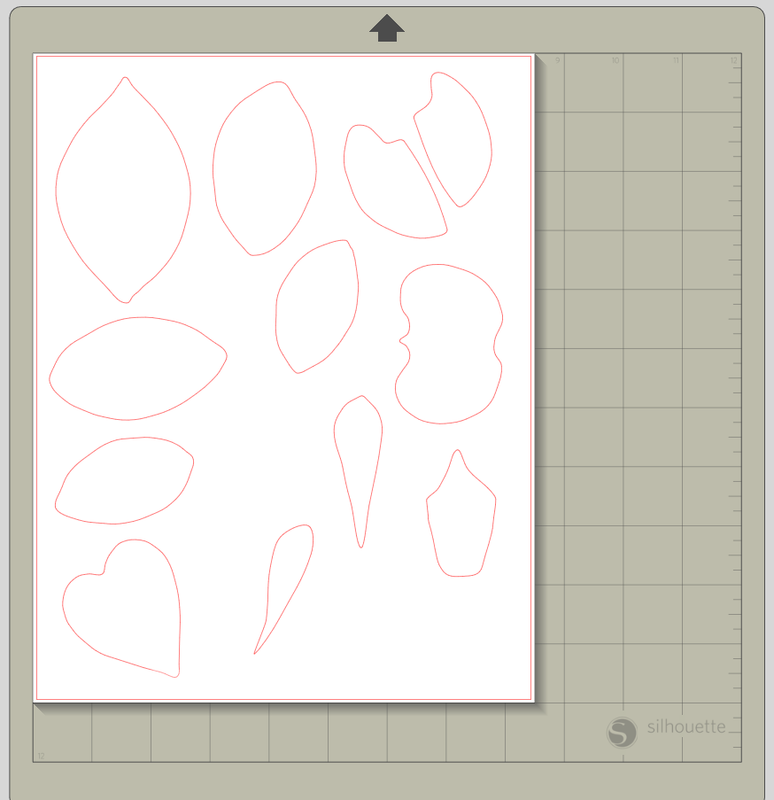 So I am done ranting about my new Silhouette Cameo. 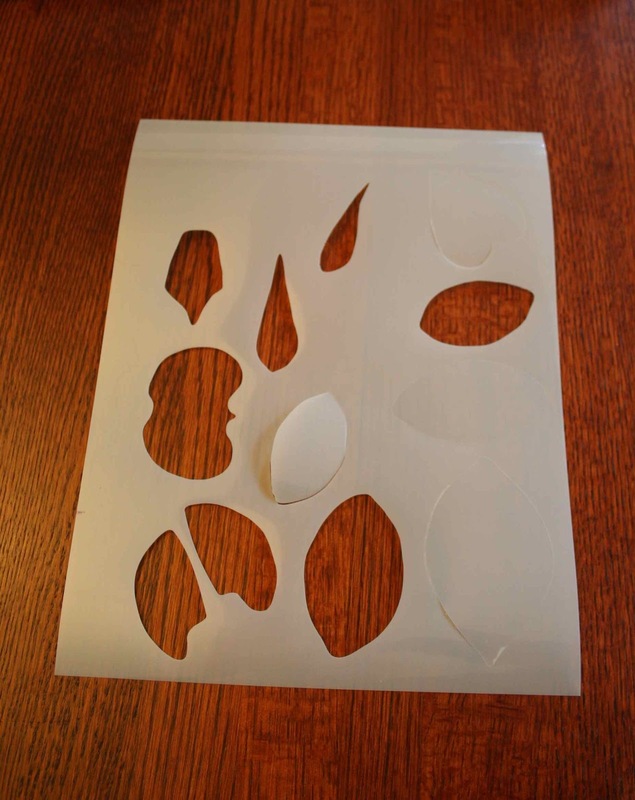 It is very good at what it does, and what it does is cut paper products. So I'm trying to figure out if I can still accomplish at least part of what I was hoping to do with this machine. 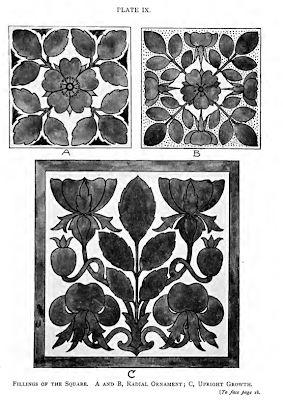 I have quite a few applique projects I would like to make. 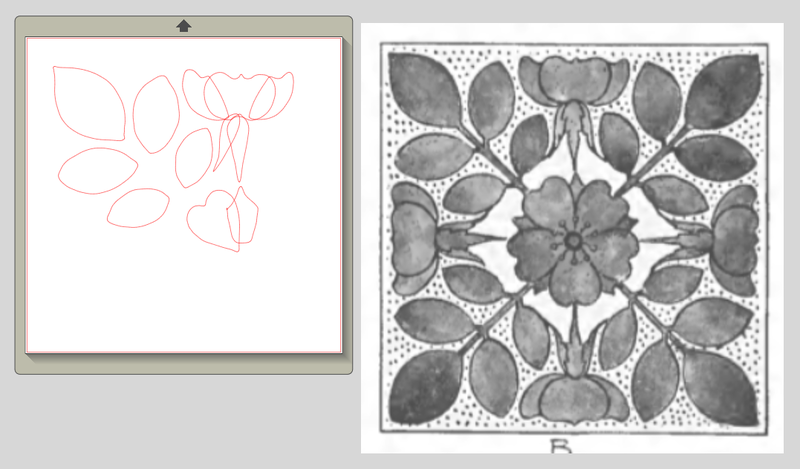 The first one I am hoping to make is a cushion design I found in a 1902 book on "Progressive Design." 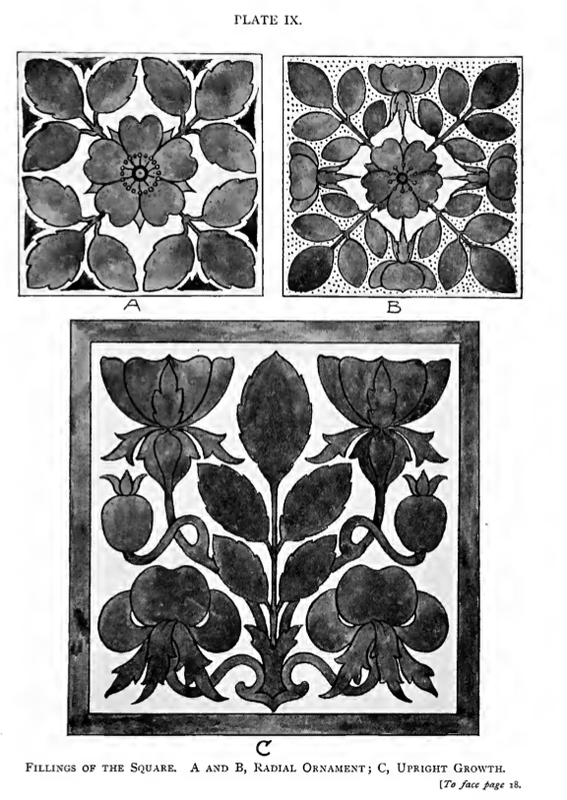 I think I'm going to start with the one on the top right. 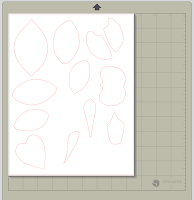 Before my experiments with cutting fabric, I had gone through and imported the design into the Silhouette Studio Designer Edition software. 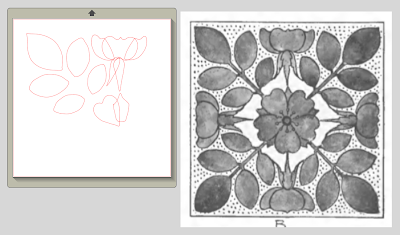 In this example, it actually worked best to size the cushion design up to the finished measurement (16"x16") and then manually draw around the shapes to make the pieces. I'm only going to make one set; I'll just repeat the pieces 4 times for the pillow. 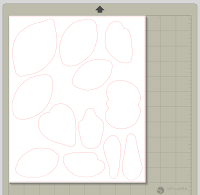 Then I found the software had a really great offset tool, so I could easily have the program add the 1/4" seam allowance. Then I went through and arranged the pieces on two separate sheets. The smaller pieces I'm going to have the Cameo "etch" on the mylar and then I'll go over it with a cutter to separate the pieces. The second sheet, with the larger pieces, I'm going to cut out of cardstock and I'll use them as pattern pieces to trace onto the fabric. I don't actually need the mylar pieces, but I was thinking it would be so much easier to iron over the 1/4" seam allowance if I can fold the fabric edges around the smaller mylar piece. 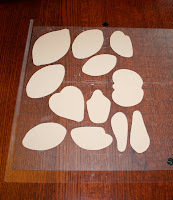 And ironing first will make it much easier to sew these pieces down on the background fabric. (A couple days later) Done! Hi, I don't know if you're aware of this trick or not, but it might put your machine to good use, since I'm fairly sure it would cut it. I don't know if you're aware of this trick, but you can use freezer paper to make really good (one-time) stencils. You cut out your pattern, then you iron it to your fabric for nice, crisp edges. It's a trick that's often used to make custom t-shirt designs, and I've used it once or twice. It would work well for your pillow idea. I just scrolled through and read all of your Silhouette frustrations. It's REALLY helpful, because this is something that I've wondered about. 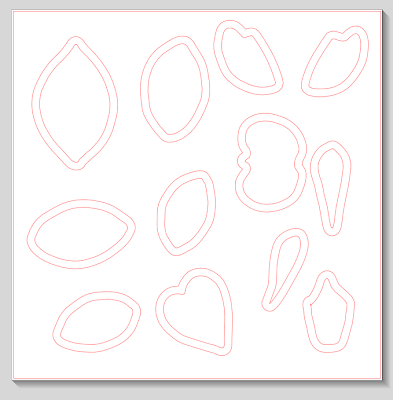 I don't do scrapbooking, but I thought a cutter thing would be good for stencils or lettering for signs, etc. I had no idea that the supplies were so pricy. I think you've helped me avoid an expensive mistake. I'm glad I could help. 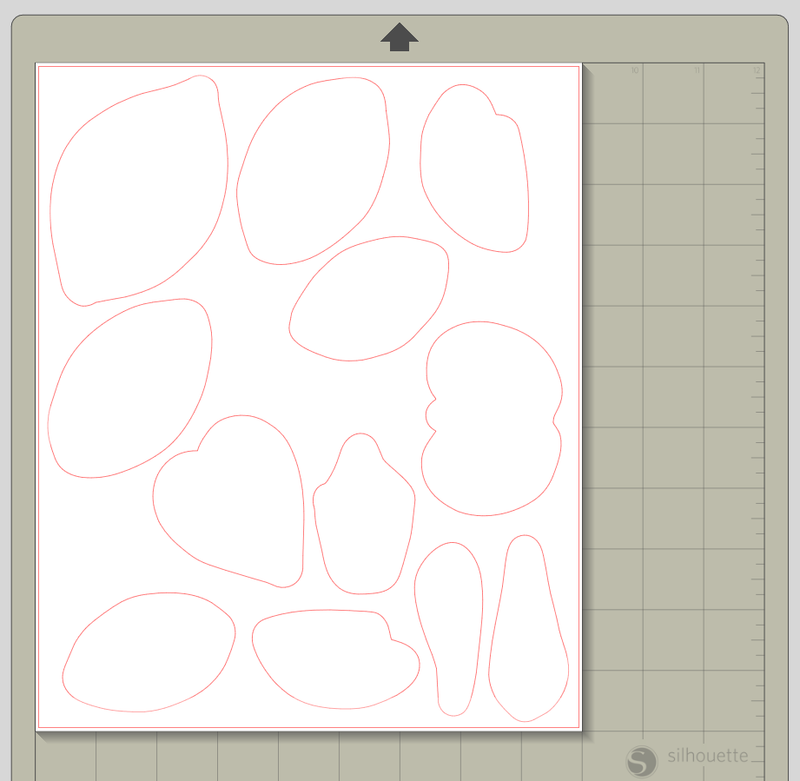 Since Silhouette is so vague at their website about what it will actually cut, and many forums give the impression the machine will cut mylar, I am doing what I can to educate their potential customers.